Lazarus– “the one whom Jesus loved” is a paradigm of every believer. by his grace and live to ‘go free’. The disciples are the ones who pretend to be brave and wise, but are often clueless. Jesus cries and is perturbed, also. ( the Greek word is a strong one, ebrimaomai, meaning frustrated, angry, sometimes used to describe a horse snorting) Why? No easy answer. If Jesus reveals to us the invisible God, what does Jesus show us here about God? Where do you see yourself in the story? Jesus waited. Scripture uses the word remained, which gives the waiting an intentionality. Lazarus was dead for 4, long days. All hope was lost. But everything is possible with God, right? As we heard in Paul’s letter to the Romans a couple weeks ago, “…hope does not disappoint, because the love of God has been poured out into our hearts…” (5:5). It was for the glory of God. God’s time is not our time. What wonderful things may lie in wait for you if you hope in the glory of the Lord? Martha is worried about the stench in the cave when Jesus approaches (as, of course, Martha would!). And don’t we sometimes get stuck in the details of life instead of the bigger picture? Jesus waves her off and focuses on why he is there, “Did I not tell you that if you believe you will see the glory of God?” Jesus is not afraid to come to our stinky, dark places and breathe new life into us! And actually, Jesus does not go into the cave but calls Lazarus out. Jesus calls us OUT of ourselves. And he calls others in to help Lazarus with the bandages. We need the support of our community to jump in and be there with us. Jesus is in the midst of it all. Do you see yourself in this? Our church? Lazarus dies, and his family grieves. Even Jesus weeps at the loss. But then, Lazarus is called out of death to life! And now we hear what Jesus really said: not that Lazarus wouldn’t die, but that death would not be the end of him. Death wins the battle, but love wins the war. So we believe. So we profess. Human suffering is a mystery we must live with and in – it is a part of everyone’s life eventually. As we head toward Holy Week, it is important to think about how as Christians we view this. What does the cross of Christ tells us about suffering? The cross does not really tell us the why of suffering, but it offers us instead the where of God’s sharing in it. When we suffer, God is in the midst of our suffering. Emmanuel, God-with-us, is also Christ on the cross, God-who-suffers-with-us. from the tomb of self-sufficiency wherein you do not admit your need for God and for one another. from the tomb of preoccupation with yourself and open your eyes to the needs of others. from the tomb of excessive busyness; take time to think, to listen, to be quiet and to pray. from the tomb of self-imposed obligations; untie yourself from the unimportant, the fleeting and the material so as to be free to experience the essential, the eternal and the spiritual. from the tomb dug deep by apathy and ignorance and be newly awakened and sensitive to the plight of the poor, the oppressed. from the tomb of hopelessness and skepticism and be renewed in the knowledge that you are mine, I am yours and we are God’s. from the tomb of needless worry and undue anxiety. Know the love of a devoted God. Find courage and freedom here. from the tomb of sin and guilt and grief. Know the truth of forgiveness — received and given. from the tomb of death and share God’s eternal life and forever love. Amen. In John’s gospel ‘miracle stories’ are never simple and are never called miracles. They are SIGNS that reveal Jesus. What do you make of this sign or teaching? What do you make of the mud/saliva paste? Jesus spits – he mixes this part of himself with the clay of the earth. (Spit, saliva, in Jesus’ day was thought to have healing properties; it actually does.) He then smears (the Greek word used means anointing) the man’s eyes with this paste and tells him to go and wash. Ordinary, even crude, elements become ways for Jesus to work. This is the essence of our sacraments. We are to be like this mud-paste; Jesus mixes into our ‘earthiness’ the healing substance of himself. We are to be people molded by Christ’s truth, transformed by his words. As this ‘mud-paste’ we are to be helping to ‘heal’ the world by being in it: we are ointment not pipelines. We help others to see Jesus more by how we are and how we live then by what we pass along. The word Siloam means ‘Sent’ – so does the word apostle. Sacraments are ‘signs’ – rituals – that send us forth; every Mass also ends with a sending forth . . . What does it mean to you to be sent? The story is about the struggle to see –what does this mean? Have you ever struggled to see? At first, the blind man only knew Jesus as a man, then as a prophet; at the end he calls him, Lord – a beautiful growth in faith . . .What did knowing Jesus as Lord ‘cost’ the man? What does it cost you? The original story in this gospel might have simply been about how a man was born blind and was healed by Jesus. This story was then later expanded due to the suffering and needs of the community for which John was writing. He was taking an experience of Jesus and applying it to the present situation. Isn’t that how the Spirit of the Risen Lord usually works? So John’s gospel has a trial and expulsion from the synagogue of Jewish converts to Christianity. This did not happen in Jesus’ day, but it did happen to those of John’s community. For this community to live through this very difficult time, Jesus must be seen and accepted as the true Light of the World that can help them overcome the darkness in which they were living. The washing in the pool of Siloam also suggests a further connection with baptism since the early Church often called baptism an ‘illumination” (photismos). Why is this reading presented during Lent? Because it is pointing to the even greater healing that Easter offers us. We need to prepare for this. Jesus himself will suffer from the blindness of the world and will die because of the blindness of evil. Jesus will descend into the unseeing darkness of mortality, death, and by doing this he will show that love – God’s love –is stronger than death. By his death the world can be healed of its hatred, fear, insecurity; it can finally, once and for all, be assured of God’s love and power to bring good out of even the worst of evils. For, it is the crucified One who is the Risen One. We need to admit that we are like this blind man; we cannot see very well. Our eyes need to be opened. Due to Jesus, we can begin to glimpse and trust God’s answer to blindness, suffering, and sin. “What really counts is our willingness to let the immense sufferings of our brothers and sisters free us from all arrogance and from all judgments and condemnations and give us a heart as gentle and humble as the heart of Jesus, “ (p. 78). Open my heart and fill me with your presence. Give me a bucket so I may draw from the well of You. just be being the person you made me to be. A Reading from the Holy Gospel according to John ( 4: 5-42). What does water mean to you? Think about a time when you have been very thirsty . . .Jesus is the one who can give us the living water that can soften our hard hearts. How can our experience of water speak to us about the life Jesus offers us? +What do you make of the setting – a well at noon, and this well is not the local well, but one that is ½ mile away? +Jesus is thirsty – he is human and in need. as he begins an encounter with this woman. For what or whom do you think the God-in-Jesus ‘thirsts’? especially as they prepared people for baptism. What does it say to you about faith and baptism? ** his ability and courage to breakdown barriers. Notice that the Samaritan woman names Jesus the Messiah when she goes into the city. Once the disciples caught up with Jesus, they call him Rabbi. Perhaps they are not ready to see Jesus as the Savior like she is. Think about people in your own life that you see all the time and yet may not really SEE them. Yet the Samaritan woman does see. She experiences conversion. Hear what Jesus says. Some people imagine eternal life as a future reality, too shadowy to have any real meaning. Jesus is speaking of something quite different, something that is already beginning now. He also calls the Samaritan woman to an authentic, personal encounter. He asks her to believe HIM, not simply his words. She most likely had plenty of relationships, but no true encounters up to this point in her life (Gittins, A., Encountering Jesus, p. 110-113). Jesus, could you possibly be the Christ? Do you think the serpent would have convinced you to eat the forbidden fruit? I certainly think the serpent would have gotten me. The brilliance of the story is how, in such a simple fashion, the seducer’s temptation covers all our weaknesses and exposes our vulnerability to sin. The serpent misses not a trick in the fall of Adam and Eve. It is the root of all temptation. Their failing is called “Original Sin” because all of our sins resemble theirs. Have you ever sat alone in an empty church before? It used to creep me out for some reason. I think I thought all the saints were looking at me. Now I find it very peaceful – highly recommend. Anyway, I found myself alone in the Union Street church this week, and I got to thinking about how my Lent is going so far. I’m doing a lot of things, but I’m kinda floating along in them. You know what I mean? Like I do them, cross them off the list and move on to the next thing. Not much is really sinking in. I’m not giving them a chance because I don’t make the time. Once that starts to happen (and I’m hoping I’m not alone here), I get punchy. I’m less tolerant, less patient with people. I go to bed at night, look back on the day and it’s a blur. I do have multiple moments of grace. I just need to pause more and allow these moments to come in and move me. This may have been only a blip in St. Kateri’s day. She probably quickly went on to something else after that. She might not even remember having done it later in the day. Or known that something BIG happened inside that little girl because of this one, small gesture. It was like St. Kateri was trying to tell me something. Take the time. Be in those moments. Allow the grace. It might be a chance for Christ’s love to shine out, and that would be a shame to miss. 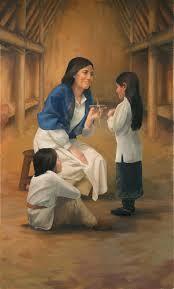 So thanks, St. Kateri Tekakwitha, and I look forward to keeping my eyes and heart more open for the rest of Lent. Who knows what I will notice, but I bet it will be good. I hope you get to notice small moments of grace in your busy days too. And maybe spend some time chillin’ with our patron saint. Is your experience of God’s presence this Lent more like a mountaintop or a journey through a valley – or desert – a cloud? What does it mean to you to have God’s favor rest on Jesus – on us? All of Lent is about either preparing for baptism or learning to live our baptism more fully. We are called to listen to Jesus – to journey with our God – to grow in holiness. All of this will mean a share in God’s glory – God’s own life, but it will also mean an embrace of suffering. Through baptism we all share in the life of the glorified Christ. This life is the blessing of holiness, promised to Abraham by God and made possible through the transformative grace of Jesus’ suffering and death. Christian living is about being touched by Jesus so that the fleeting moments of glory are made permanent in bettering the lives of others. ‘Coming down from the mountain’ may be a metaphor for the need to take up the ministry of Jesus. Listening to Jesus and being touched by him should draw us outside of ourselves – and our ‘comfort zones.’ We don’t build tents: we feed the hungry, cloth the naked, touch the downhearted, visit the lonely, encourage the discouraged, etc. In this way Christ touches others through us. This kind of living is eminently practical and requires a real and constant dying to self. Why do we try to live this way? Because we have great hope in the outcome: helping to create a better world here (God’s kingdom) and forever. 1) The account of the Transfiguration is sandwiched between two predictions of his passion and death. 2) Peter, James, and John were also the three who were with Jesus in Gethsemane. 3) Jesus tells his disciples not to mention this vision until after his suffering. The image of Christ transfigured is that of Christ being glorified after the suffering and death. How do you understand what is called the paschal mystery? The paschal mystery is the mystery of how we, after undergoing some kind of death, receive new life and new spirit. Jesus, in both his teaching and in his life, showed us a clear paradigm for how this should happen. “Unless a grain of wheat falls into the ground and dies, it remains only a single grain; but if it dies it yields a rich harvest.” (John 12:24) These words of Jesus define the paschal mystery: namely, in order to come to fuller life and spirit we must constantly be letting go of present life and spirit. Terminal death is a death that ends life and ends possibilities. Paschal death is a death that, while ending one kind of life, opens the person undergoing it to receive a deeper and richer form of life. Daily we undergo this paschal mystery. Name your deaths (Good Friday). Grieve what you have lost and adjust to the new reality (the 40 days after Easter). Do not cling to the old; let it ascend and give you its blessing (Ascension). Have you ever experienced a transfiguration? Have you ever seen a plain girl become a radiant beauty when she is seen through the eyes of love? Have you ever seen a timid, ordinary person become a ‘lion’, a hero, when someone was in need of help? Have you ever noticed a homely face become remarkably attractive as they share their enthusiasm for something they love? Have you ever met someone who appeared to be rather ordinary only to discover how extraordinary they really are? Have you ever felt tired, discouraged, and alone only to quietly, but deeply begin to feel God’s presence and care? Afterwards, you can’t really doubt that it was from God, even though you may still not understand it. These experiences may help us to understand a little better the gospel experience. For a moment the three disciples experience Jesus in the complete union with God that he is. Maybe your life is very different than mine. Maybe in your life you simply have too much time and you are looking for ways to waste it. Maybe you have an overabundance of energy at the end of the day, and you want to spend it on something useless. If that is true than the next few hundred words will be a bit of a waste for you. But if not, I have something that promises to save time and energy and it will cost you nothing. What if you gave up worrying?